The Institute of Applied Manpower Research (IAMR) the only institution of its kind was established in 1962 under the Societies Registration Act of 1860 as an institution that would function as a clearing-house of ideas and undertake policy research on human capital development to inform perspective planning and promote policy integration. The main object of the Institute is to advance knowledge about the nature, characteristics and utilization of human resources through research, education and training, consultancy etc. IAMR has been renamed as National Institute of Labour Economics Research and Development (NILERD) on 9th June, 2014. NILERD is mainly funded by grants-in-aid from the NITI Aayog (formerly Planning Commission), Government of India, and supplemented by its own revenue from contracted research projects, and education & training activities. The prime objective of NILERD has been to develop an institutional framework capable of sustaining and steering a systematic applied human resource planning research process. Since its inception, the Institute has carved out its own trajectory to achieve academic heights, and in the process, developed a range of academic activities not only in the field of human resource planning and development, but also in monitoring and evaluation of public policies and programmes. During the past few years, the Institute has exhibited remarkable dynamism in addressing the issues of national priorities. The Institute has emerged as a pioneering institute in providing academic training on human resource planning and development for both international and national participants. The chief executive of NILERD for its management is Director-General (DG). The academic activities of the Institute are carried out through various technical units headed by a senior level officer and assisted by necessary supporting faculty and staff. The administrative support is provided by an Administrative Officer and financial support is provided by Joint Director (Finance), with necessary support structure. The Institute has a modest computer center, an editorial unit and a knowledge resource center (KRC). The Institute publishes a half yearly journal titled, Manpower Journal, with the Director-General acting as Editor-in-Chief. The academic activities are organized through various units dealing with research on various sectors, training – national and international – education, seminars and workshops. The administrative and academic support for the Education and Training (E&T) Unit is provided by a Director assisted by other faculty members. The Institute moved to its own campus at Narela in 2002 Narela is a developing urban and institutional hub declared as a special economic zone for knowledge in the National Capital Region and the first municipality in India to launch the personal identity smart card in 2007. 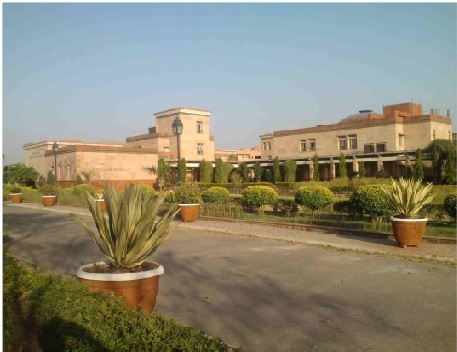 The NILERD Campus is about an hour's drive from Delhi's Indira Gandhi International Airport, and is adjacent to a government hospital in front of a forested park 'Smriti Van'. The 16-acre campus has been designed from the perspective of a holistic residential academic community. The campus caters to all the academic activities of the Institute, and the infrastructural and environmental needs of the resident community and visitors. The participants of all educational and training programmes are hosted in residential accommodation on the campus itself. The campus has facilities for indoor and outdoor games and recreational activities for participants and resident staff. NILERD has its own LAN network and internet connectivity. The campus has residences for faculty, staff and students, an auditorium, an academic and an administrative block, a management and computer center, a conference hall, seminar halls, committee rooms, a guest house, students' hostels, a library and a canteen amidst a natural ambience rare in Delhi. A bank operates an extension counter on the campus.